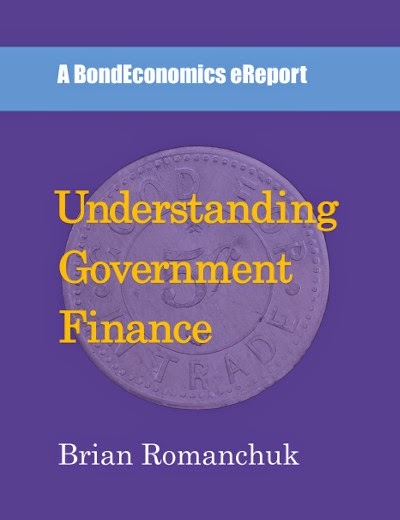 The first BondEconomics eReport: "Understanding Government Finance" is expected to be released for sale in mid-June has been released; details available at its product page. It provides an introduction to the operations behind government finance, aimed at a non-specialist audience. It will be initially published in ebook formats (epub and Kindle), followed by pdf and paperback editions. Size: Around 30,000 words, 15 figures. 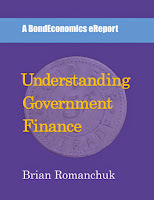 This report examines the underlying principles of government finance for a central government with a free-floating currency.This is done by examining financial operations within a simplified yet realistic monetary framework. Then the effect of deviations from this framework by real world governments are discussed. What is demonstrated is that we cannot compare such a government to a household. Unlike a household, governments are not bound by purely financial constraints, nor is there any need to pay down its debt. This report is aimed at a relatively wide audience that has an interest in finance and economics. The focus is on the operations behind government finance, and so there is limited discussion of economic theory. However, the analysis is within the tradition of Modern Monetary Theory (MMT), and so it provides an introduction to some of the concepts used within that body of thought. Could you post a contents page. One guaranteed buyer whenever it comes out. My hope is that it will appear by June 15th, but I do not know how long approval by retailers will take. (I have heard that it is only a couple of days, but since I have not done the process yet, there may be snags.) Timing also depends upon the feedback of my editor; if the document is a a sea of red markings, things may be delayed. I also have to wait for more feedback. In a discussion with one reader, I realized that I need to add a section. (Apparently, not everyone knows a lot about the bond market; after working for 15 years in fixed income, I forgot about that...) Therefore, I do not want to post the table of contents until that is sorted out. I'll purchase your paperback version. Any chance of getting the author's signature? When the paperback is out,we can arrange something. You would need to contact me directly. If there's a few people who are interested, I may need to set something up on eBay. The book was set up as an ebook, which means I have the opposite formatting issues of most publishers. For them, they are used to setting up print editions, and then converting to ebook is a challenge. In my case, I will probably need to find someone to do the formatting conversion.